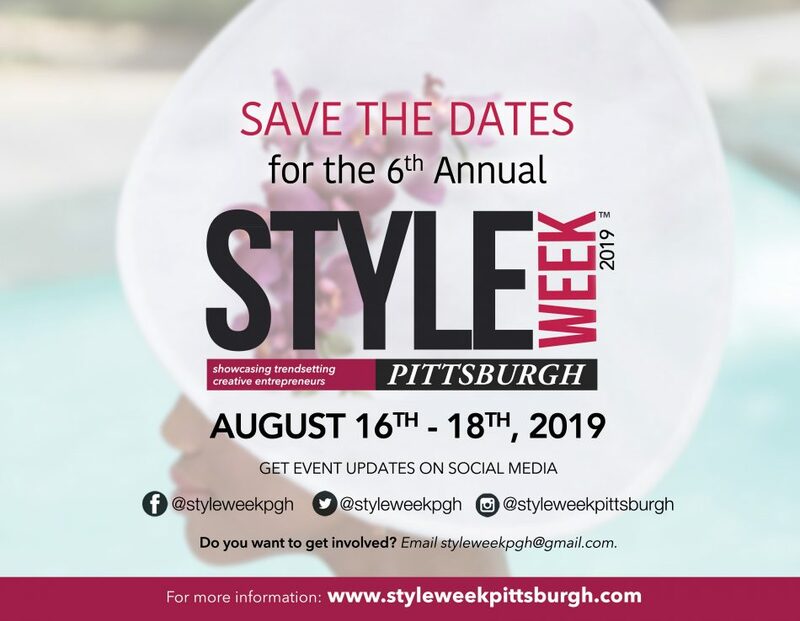 STYLE WEEK PITTSBURGH | SAVE THE DATES AUGUST 16th-18th FOR STYLE WEEK PITTSBURGH 2019! 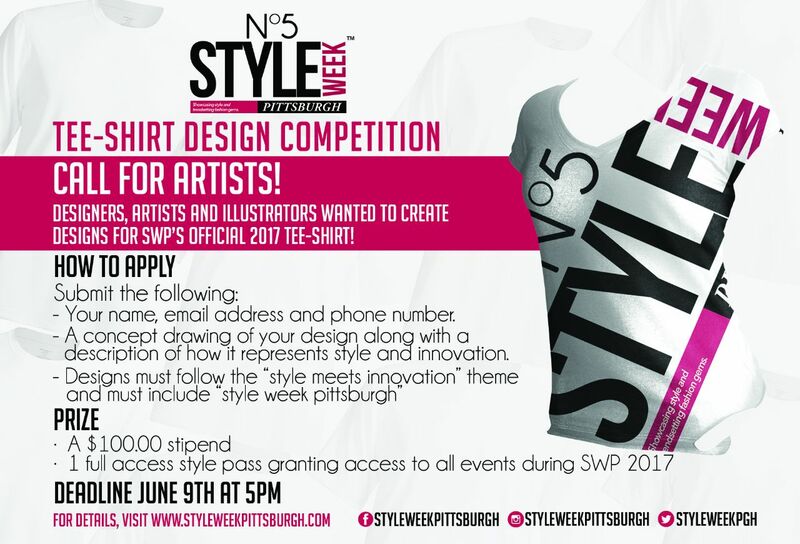 Style Week Pittsburgh (SWP) is seeking designers, artists, and illustrators to create designs for SWP’s official 2017 Tee-Shirt Design Competition. Fill out the form below to enter! Deadline is Friday June 9th 5pmEST. 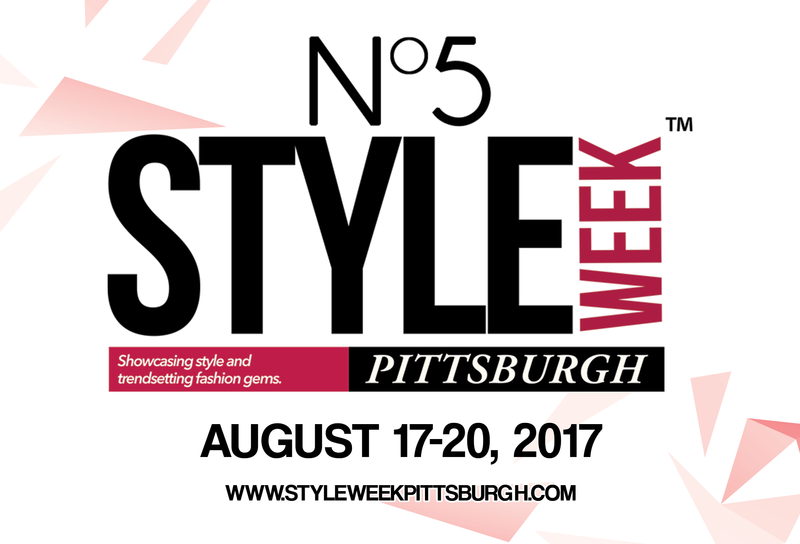 The 5th Annual Style Week Pittsburgh (SWP) kicks off August 17-20. Since its inception in 2012, the Style Awards has recognized the leading fashion-focused brands and creative innovators for their extraordinary accomplishments. Past winners include; Philip Pelusi Salons, Style Truck, Emmai Alaquiva, Demeatria Boccella, Nicole Manns, Danielle Mock, Leigh Solomon-Pugliano, Christina Stein, Patty Bell, Nisha Blackwell, Gilded Girl Beauty Emporium and Christian Diboko. 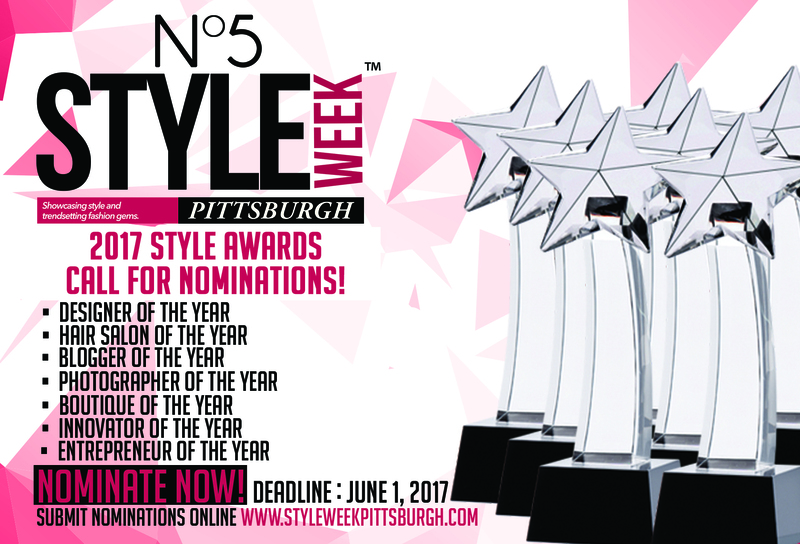 Nominations are open for 2017 Style Awards now thru May 30th. Nominate an outstanding PHOTOGRAPHER who has an eye for capturing the most unique images. Nominate a fabulous BLOGGER who’s digital features captivate and engage their audience. Nominate your favorite style BOUTIQUE. Nominate an innovative HAIR SALON that transforms and pushes the boundaries of beauty. Nominate an acclaimed and accomplished designer of fashion, accessories, or shoes. Nominate an outstanding ENTREPRENEUR with an innovative business model. Nominate an individual or team who has introduced new methods, ideas, or approaches to business, fashion, or the arts. Join us for the Style Awards on Friday, August 18, 2017. On January 13, 2017 I was given the amazing opportunity to attend the Teen Vogue magazine headquarters in New York City. Being that I am an online fashion student for the Parsons and Teen Vogue program, the students had the privilege to be eligible for this event to learn and network with some of the industry’s best. As soon as I received my invitation to the event I knew this was the perfect opportunity to represent Style Week Pittsburgh in the best light, and I was beyond elated to do so. Soon after a panel of editors entered the room and gave us all the most gracious greeting. I couldn’t believe I was in the same room with Teen Vogue’s editor and chief, Elaine Welteroth. We had the opportunity to have an open Q&A with the panel of editors. It was so insightful to hear their take on building your brand, how to showcase your aesthetic, enhancing your visual style, the best tips on using social media for your brand, and how to stay inspired. It was so enlightening and I definitely took notes to take back home. I also loved hearing about the editors talk about their favorite trends this past season, from 70s vibes to 90s grunge. It was amazing to think that all of the trends I had been following by reading through those glossy pages of a magazine were created by the people right in front of me in the very same room. Sharing Style Week with Teen Vogue’s editors was amazing, and it was even more amazing how many questions they had about it and wanted to learn more and stay connected with us. So I think it is safe to say Style Week Pittsburgh has been Teen Vogue approved! That’s right; Style Week Pittsburgh is ready to take over the globe! The rest of the day was filled with exclusive activities. We had a conference with College Fashionista’s founder, Amy Levin on insightful tips for entrepreneurs. We also had an exclusive tour of Teen Vogue’s fashion closet where many celebrities and talents have been styled. My favorite part, though? Receiving styling tips from Teen Vogue accessories editor, Kirby Marzec for our very own Teen Vogue photoshoot! She gave us the best styling tips to keep in mind for a shoot, and we got to experiment with it firsthand by having a professional Teen Vogue photoshoot of our very own. Considering that I am an aspiring stylist, that was the most crucial part for me and I definitely got the ultimate photoshoot experience. Kirby’s advice was simple yet profound. She simply said to us, “Stay true to your aesthetic.” Then it was great to hear that she and I both shared the same love for moto jackets and anything in black. We were basically twining outfits, it was too cool.